Here are some personal observations and opinions that I thought would be worth sharing from my experience as both a candidate/participant and as an instructor on CAA and CSGA Guides courses. Prior Planning Prevents Piss Poor Performance. Be prepared, practice and train, well ahead of the course. Get a training buddy and make a regular schedule. Ideally it’s someone who’s going to the same course so there’s some additional motivation. It might be someone who’s training for a lower or higher level course, that’s OK too as the sharing of information will help. Often more experienced folks like to participate and assist, see mentorship below. Make sure you are training on the right things, to the right standard for the course you are about to take (see below). Certain organizations have certain standard ways (techniques) of doing things. Be it the CAA, CSGA or ACMG, find out and learn the standard systems and techniques the organization conducting the course uses. Practice and perform this method so you can do it in your sleep, then perform during the course and most importantly on the exam. This is especially relevant for hard skills such as rope systems. Even the best prepared person might get corrected or shown a different way by an instructor when you perform the skill on the course in a non exam setting. Don’t be defensive or make excuses, you’ve been given a gift on how you can pass the course (shut up and listen). Listen, observe and make that correction when you perform the skill next time. Yes, I know your way might be a way better tool, you might be quicker or more efficient, but do it the way the organization and instructors want it done, then you will increase the chance you’ll pass. If you really hate the method so much, once you’ve passed the course you can volunteer to be on the standards or technical committee then you can contribute to the change! Often if we think about it more often the different methods achieve the same goal, but on a course, do what the examiner wants, it’ll help you pass. Examiners want you to pass. If you know you are going on a course, find someone (or a few folks) that you can talk to. It is worth finding someone you can share your mistakes and be able to open up to. You may want to consult a more experienced person, who may be available to debrief your day of work in the mountains from time to time especially after significant events. Don’t wait until the moth before the course start the season before. Mentors are a great way to become a better mountain professional, and to successfully pass courses. Experience has shown those who find experienced mentors often perform better at courses (and make better decisions). You may have a number of mentors on different topics. They can be at your workplace, in your home town or on the phone. Try using your spouse as a sounding board. On an exam there are often rote skills you will need to perform to a standard, e.g. transceiver tests, snow observations (profiles) crevasse or rope rescue skill demonstrations. You should make time to practice and to be so good at these hard skills before the course starts. Then, when exam time comes around it will be low stress and easier to pass these “hard skills”. This means that when you are at the course you can spend your valuable time and energy on learning watching and refining the “soft skills” like mountain travel and awareness. You now have the ability to demonstrate and perform at your best for the other more difficult to demonstrate skills such as the elusive “mountain sense”. If you know you are going on a course, look at all your gear: from skis, bindings and skins, snow safety gear, shovel, probe and transceiver, rescue equipment (improvised toboggans, rope rescue gear). Does anything look close to being worn out, do you have any pieces missing, does anything need replacing before the course? If so replace it and use the equipment well before the course begins. Break in those new touring boots before well before the course. Where is the exam being conducted? Is it in your back yard? Is it in a different snow pack and climate zone. No matter where the course is It’s always good to take a trip away to train in other areas to broaden your experience. Travel in terrain and snow packs you are not familiar with. Arrive a few days early near the course venue so you can learn more find out from the locals about the weather, snow and terrain as well as get a day or 2 in the field to look for your self. Be prepared, train and practice. Bill Mark has been working in the winter skiing and snow safety business since the mid eighties. He began his career as a ski patroller in New Zealand and then worked at Blackcomb Mountain in Whistler where he was a ski patroller and was the Ski Patrol Director until 1999. 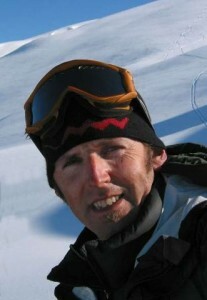 Since then he worked full time as a ski guide for Mike Wiegele Helicopter Skiing where he is now a lead guide. He is CSGA L3 certified, and has ISIA full certification (from NZ). He also instructs on CSGA courses and on CAA Industry Training Program’s L1 & 2 courses.